it fits in my palm like a paw. flanked by what it last held. like fur under my finger. The reason this poem is so effective is that Anna Kisby, poet-archivist, is attentive to detail of objects and how to intensify the emotional impact they had on her without over-exaggeration. My poem here isn’t about a suffragette but it is about a remarkable woman, Dorothy Hodgkin, pioneer in X-ray crystallography, is the only British woman to have received the Nobel Prize in chemistry in 1964. 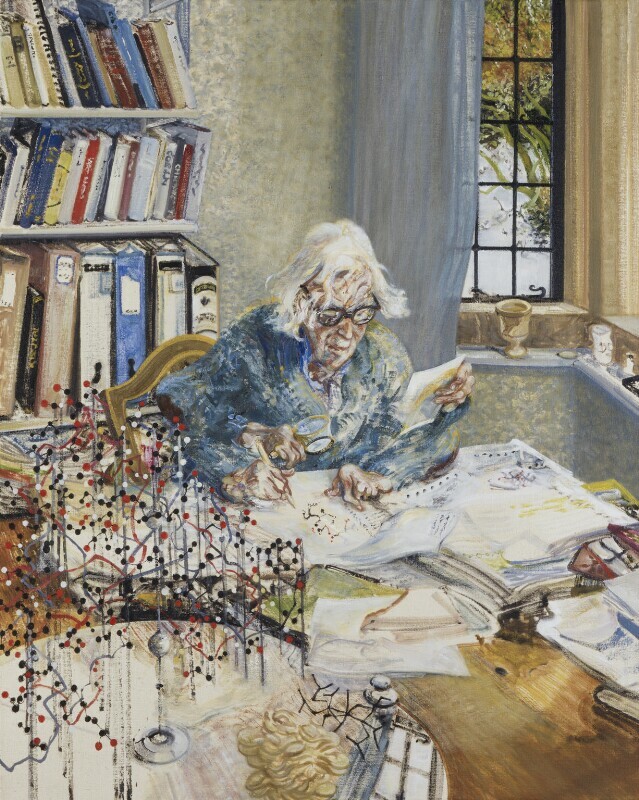 My poem was written in response to Maggi Hambling’s 1985 portrait of Dorothy Hodgkin which is in the National Portrait Gallery. I loved this vibrant, positive image of an older woman engrossed in her work. A version of this poem was first published in Images of Women; an Anthology of Contemporary Women’s Poetry, edited by Myra Schneider and Dilys Wood, 2006, Arrowhead Press. her sweater, glasses, the lines on her face. away a stockade of men in white coats. Today she is eighty-five. So much to do. So far to go. I shall go on enjoying all the coverage of inspirational women and hope this current groundswell will signal a push to overturn inequities that still exist. Previous Post ‘The Talking Cure’ – from first to final draft.